TBILISI, DFWatch–The third day of Batumi Summer Set electronic music festival had to be canceled due to bad weather as water flooded the festival area and destroyed equipment. The festival in Georgia’s largest Black Sea beach resort started on August 22 with Danish electronic band Laid Back on the stage. Georgian newcomer Solar Eclipse opened the festival. Mexican DJ Betoko, German DJ Phon-o and Sunkro from UK also performed on Thursday. August 23, most of the guests that we met came to listen to the Danish Sleep Party People. 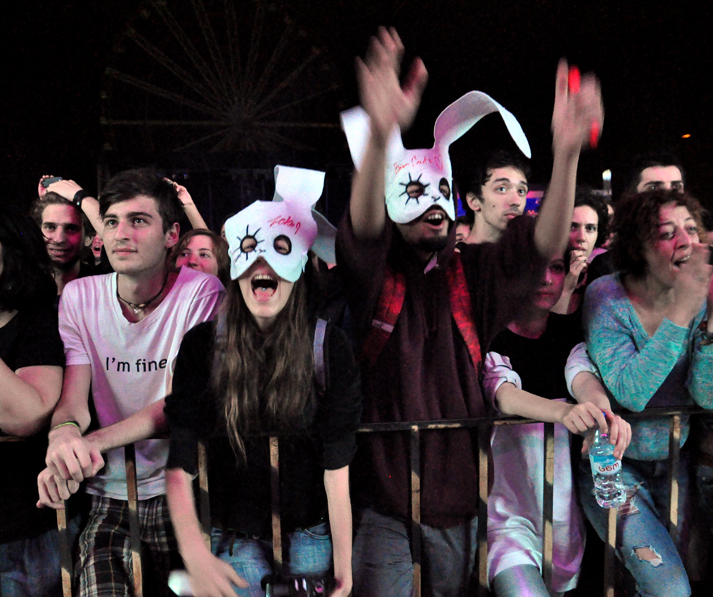 Fans wore white rabbit masks like the band is known for using during performances. “It is very rare that well-known bands come to Georgia, until very he last years. We had Deep Purple and Tricky this year as well, and now I still cannot believe that Sleep Party People will stand in front of me on a stage and perform for me,” Lela, 24, from Tbilisi says, adding that she bought tickets for all three days as she loves a few tracks by Laid Back and is lookling forward to seeing Faithless perform. Despite the rain, hundreds of people stayed until very late night to listen to their band. Many of the guests said they enjoyed hearing Giraffage, a 23 year-old musician from San Francisco. Both days there were performers from Georgia who warmed up the crowd. August 24, Faithless was to perform. A survey done beforehand showed that the majority of the visitors to the festival were planning only to attend the last day when Faithless performed. But in the afternoon of August 24, Batumi was hit by heavy rain. The festival area was flooded and most of the equipment destroyed. Nick Dvalidze, the festival’s PR manager, told journalists that the third day of Summer Set was postponed. He said that everyone who had tickets will be able to attend a concert in September, but most likely this will be held in the capital Tbilisi. No date has been announced. Apart from Faithless, a few Georgian bands were also set to perform, including a new musical project by Maya Darsmelidze called Mao and Mins. Also Rone, which performs minimal and techno, was to have played.